If you’re in Athens, Georgia, on Thursday, April 22, 2010, please head on over to Gosford Wine at 7pm, for a chat with Ari. He’ll have copies of Zingerman’s Guide to Better Bacon on hand for signing. Hope to see you there! Reservations required! Please call ahead to save your spot. Love bacon? If you’re in Chicago on April 10, 2010, you’re in luck – it’s Baconfest! And Ari will be there too, somewhere! See http://baconfestchicago.com/ for more information about the festival. I did these two recipes as small test batches, to see if I liked them before I served them to guests. I went to Monahan’s fish market, and got three Atlantic oysters (from Cape Cod – I think they were called Wiona but it might have been Wionna), and three Littleneck clams, all fresh and they shucked them for me and put them in containers with their juice. I had Nueske’s applewood smoked bacon, sliced medium-thick. I cut three slices in half. 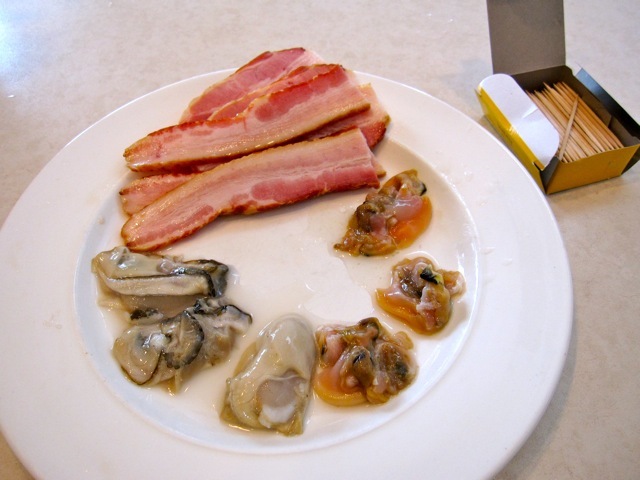 Here’s the raw ingredients; the oysters are larger than the clams, they’re the lighter colored ones, on the left. I preheated the broiler to 500. 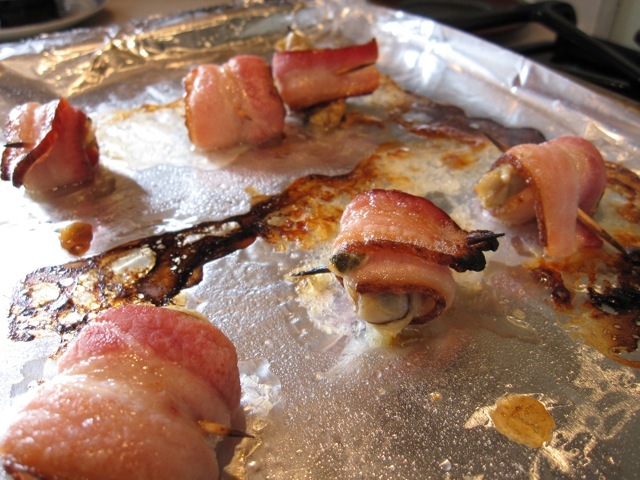 I wrapped the shellfish – the bacon was thick and the shellfish small and slippery, so I did not wrap them tightly – about 1-1/2 times around with the half slice of Nueske’s. Using a toothpick to hold it together was essential. The oysters were about twice as large as the clams so easier to wrap. The clams are smaller, they are the row on the left, oysters on the right. A closer look at the wrapped oysters. I put them on a piece of tin foil right on the surface of the baking sheet, I did not use a rack. I broiled them 5 minutes, then flipped them, and broiled 5 minutes more. They gave off a surprising amount of juice – maybe because I’m used to doing this with dates and prunes! Took them out, let them cool a minute or two, and then dove in. A nice chewy, juicy, meaty mouthful. Eating them side by side, I can say that the oysters really shone – their flavor came through very well and was a wonderful complementary flavor with the mild, lightly smokey Nueske’s. The clam flavor was harder to find, it got a bit lost in the bacon. 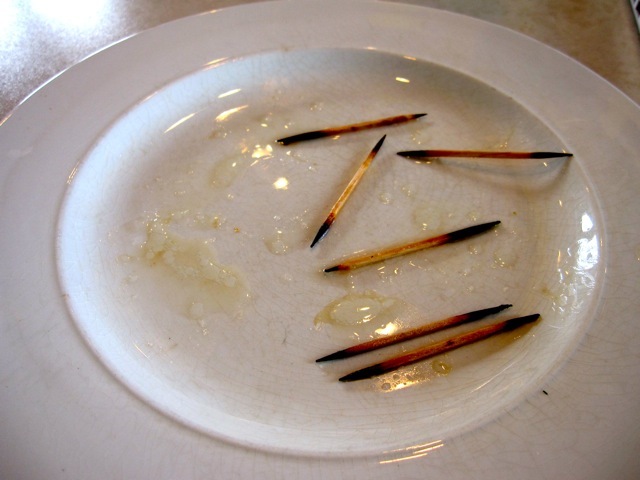 That said, I still ate them all, each a nicely textured, flavorful mouthful! So I would definitely make the bacon wrapped oysters again for an appetizer. Yum. And if you have an abundance of clams, this is a fine way to go as well, it’s just a more subtle flavor. Wrap a half-slice of bacon around each oyster and then run a toothpick through the whole thing to hold it together. 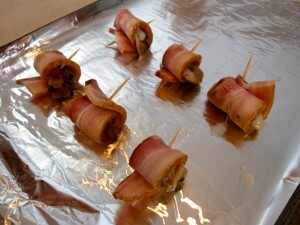 Place on a baking sheet, run it under the broiler and cook until the bacon is done, giving it a turn halfway through. If you want the bacon well done you can cook it part way in a pan before wrapping it around the oysters. 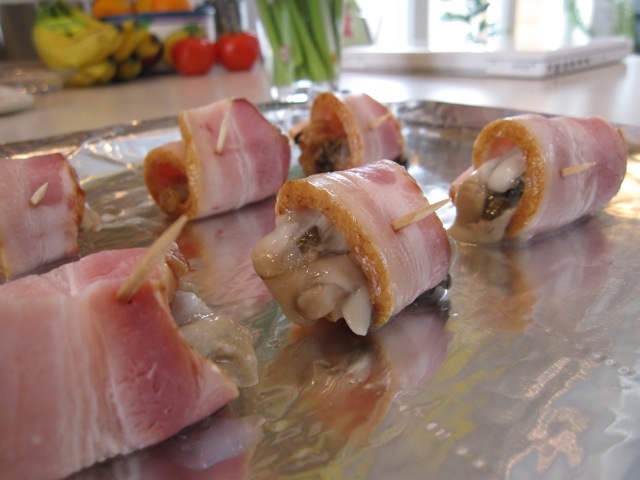 This is the same dish as Angels on Horseback, but made with fresh clams instead of oysters. Gotta love the name, which I came across in Sherlock’s Apalachicola cookbook! 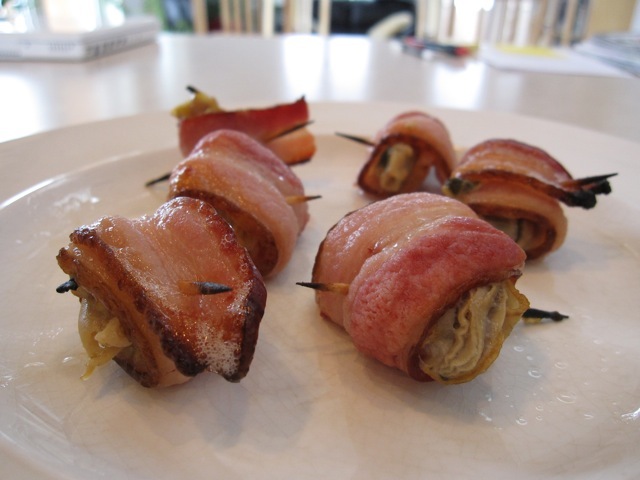 Follow the instructions for Angels on Horseback, substituting the raw clams for oysters.